Pride and Prejudice is one of Jane Austen's most famous novels. The romantic novel tells the tale of Elizabeth Bennet and Fitzwilliam Darcy while providing humorous commentary on societal norms, manners and social status. Here is a collection of great quotes from this book. "I declare after all there is no enjoyment like reading! How much sooner one tires of any thing than of a book!" "I have not the pleasure of understanding you." "To be fond of dancing was a certain step towards falling in love." "He is a gentleman, and I am a gentleman's daughter. So far we are equal." 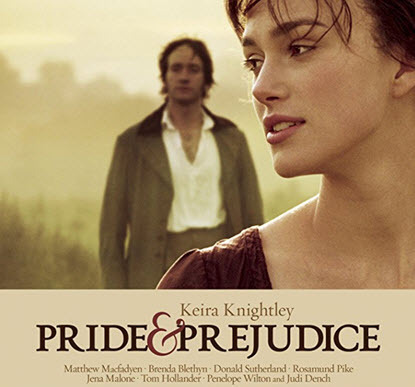 Keira Knightley starred as Elizabeth Bennet and Matthew Macfadyen was Mr. Darcy in the 2005 film, Pride & Prejudice. You could not have made the offer of your hand in any possible way that would have tempted me to accept it." "Till this moment I never knew myself." "My feelings are not puffed about with every attempt to move them. My temper would perhaps be called resentful. My good opinion once lost is lost forever." "I have been a selfish being all my life, in practice, though not in principle." "I could easily forgive his pride, if he had not mortified mine." "Oh, Lizzy! do anything rather than marry without affection. Are you quite sure that you feel what you ought to do?" 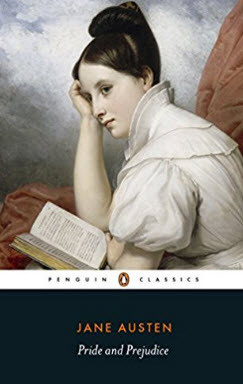 The cover above is the Penguin Classics edition of Pride and Prejudice with an introduction by Tony Tanner. It is available on Amazon.com. *Note: You can find more Jane Austen resources here.